The public comment period for the highly controversial U.S. Environmental Protection Agency’s (EPA) fracking study ended on August 28. Food & Water Watch, Environmental Action, Breast Cancer Action and other advocacy groups delivered nearly 100,000 comments from Americans asking the U.S. EPA to redo their study with a higher level of scrutiny and oversight. The City of Youngstown is asking the Ohio Supreme Court let voters in the city decide if they want to ban fracking inside city limits. Law Director Martin Hume filed a request with the high court seeking an expedited order that would compel the Mahoning County Board of Elections and Ohio Secretary of State John Husted to place the proposed charter amendment commonly known as the Community Bill of Rights on the November 3, 2015 ballot in Youngstown. Earlier this month, Youngstown City Council unanimously passed an ordinance directing that the proposed charter amendment be forwarded to the Mahoning County Board of Elections to be placed on the ballot. Two days later, the Mahoning County Board of Elections voted 4-0 to deny placing the proposed charter amendment on the ballot, in spite of the fact that the Mahoning County Prosecutor’s office said that the Board had a mandatory duty to place the proposed charter amendment on the ballot. The price of oil has tumbled 58 percent this year to reach a six-year low earlier this week. Even if prices stay at these levels, chances are they won't impact the Federal Reserve's interest-rate plans. 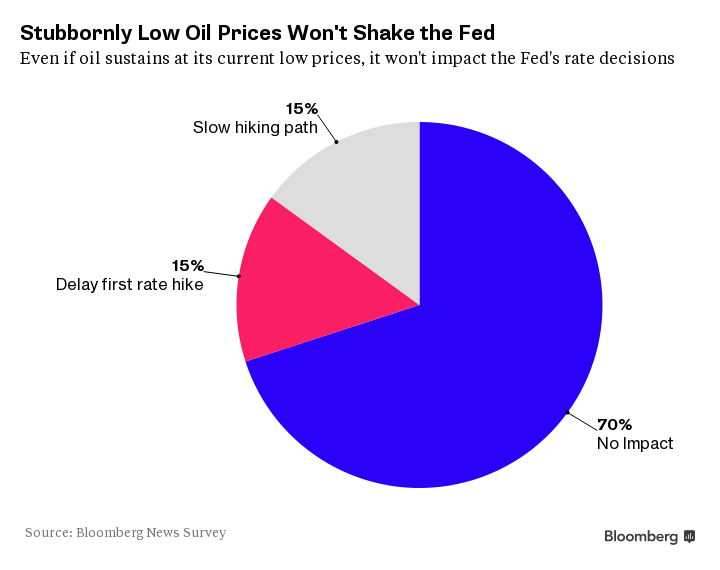 Seventy percent of economists in a Bloomberg News survey said crude oil prices around $40 per barrel for the next three months would have no impact on the Fed. Of the 30 percent that said it would influence the central bank, the respondents were evenly split between whether it would cause a delay in the first interest-rate increase or slow the hiking path. The fed funds rate has been at a range of 0-0.25% since the end of 2008 and officials meet September 16-17 to decide whether an interest rate increase is still warranted. New York Fed President William Dudley said Wednesday that the case for raising rates in September is less compelling after recent market volatility. NCPA VP Jacki Pick: "Fracking is Our Clean Power Plan"
As environmental groups gather to strategize maximum mileage from the president’s “Clean Power Plan,” they would do well to remember what they might regard as the greatest environmental triumph of this century: The U.S. already leads the world in carbon emissions reduction, with emissions down 26% since the shale boom hits its stride in 2007. Why? Because of the use of natural gas, a fossil fuel, now produced in historic volumes made possible through fracking, or hydraulic fracturing. Our economic growth was largely the result of cheap fossil fuels. They feed our electric grid, enable the digital revolution, run our transportation sector, manufacture American durable goods and electronics, and produce petrochemicals and pharmaceuticals. Fracking was key to our growth in fossil fuels production; the Independent Petroleum Association of America notes that more than 1.2 million wells have been fracked in the U.S. Because of historic production through fracking, the U.S. was the top natural gas and petroleum producer on earth in 2014, and our energy costs have fallen. U.S. industrial electricity costs are now 30-50% lower than those of our foreign competitors, resulting in a manufacturing renaissance and the “reshoring” of perhaps millions of American jobs, according to a new report by the Boston Consulting Group. By 2018, enhanced fossil fuel production through fracking will enable the U.S. to manufacture goods cheaper than in China. A century and a half ago, in August 1859, on the eve of the Civil War, Col. Edwin Laurentine Drake completed the first commercial oil well in the U.S., at Oil Creek just outside of Titusville, Pa. Over the next 155 years, oil and gas companies have drilled tens of billions of barrels of oil from the ground, from California to New York and nearly everywhere in between. Over that time period, one thing has been constant: Doomsayers and declinists have predicted that America would soon drill its last barrel of oil. Famously, in the 1920s, the U.S. Department of Interior projected less than a few decades’ worth of recoverable oil remained in the U.S. ‎ Jimmy Carter declared in 1980 that, by 2000, we’d be nearly out of oil – running on empty. Last month, the Department of Energy reported that the U.S. hit a new energy milestone: We produced 9.52 million barrels a day. That was the most in recorded history. So much for running out. Something else has happened in recent weeks that almost no one – least of all President Obama – would have predicted. The price of oil fell below $40 a barrel. Adjusted for inflation, that makes oil cheaper today than almost at anytime in history. Adjusted for wages, we work less today than ever before to get gasoline and oil. Continue reading this opinion piece by clicking here. There have been many similar opinion pieces over the past few years, pointing to the failed predictions of peak oil proponents as shale drilling has led to increased oil and gas production. Of course, the argument of fossil fuel opponents doesn't center solely around the availability of more supply, but the wisdom of using that supply instead of shifting to renewable or cleaner forms of energy. 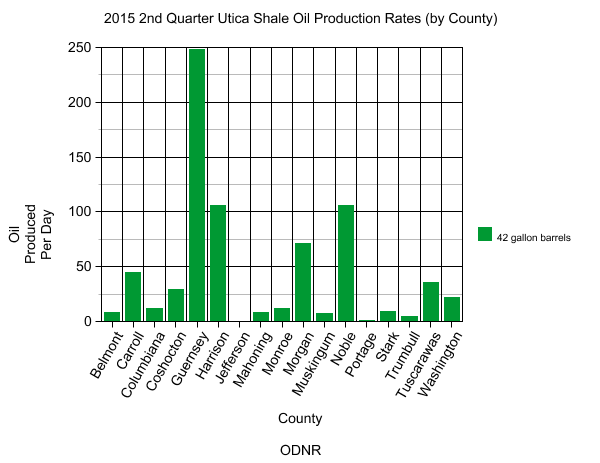 The Ohio Department of Natural Resources has now released the production data from the Utica shale for the second quarter of 2015. As always, we are going to give you a look at how the numbers compare to past quarters, past years, and how they break down among the various drillers who are active in Ohio and the counties where they are drilling. We also have the top 10 oil and gas wells detailed below. So let's dive in to the numbers. One notable thing right off of the bat is that the report shows that there are now over 1,000 wells listing production data for the first time. The most recent weekly permitting report showed 998 producing wells. As the above table shows, production continued to increase, and so did rates of production. After seeing oil production increase by nearly 24% from the 4th quarter of 2014 to the 1st quarter of 2015, it increased by 27% in the 2nd quarter. Natural gas production went from increasing just 11% in the previous quarter to a 21% increase in the 2nd quarter of 2015. 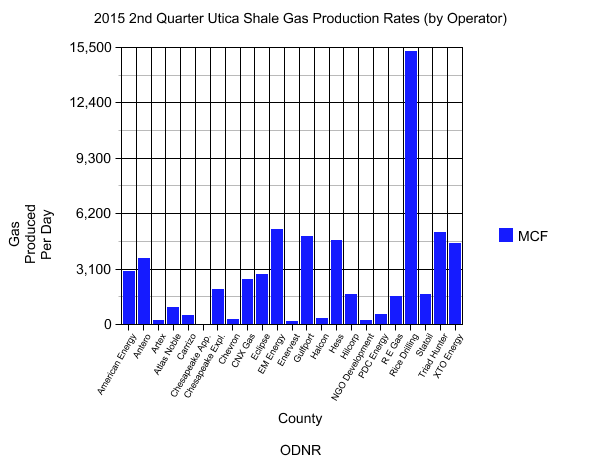 The numbers above show how rapidly the Utica shale has grown as well. There has been nearly as much production in the first two quarters of this year as there was in all of 2014. It's also noteworthy that it the Utica shale has passed 25 million barrels of oil produced and is nearly over 1 billion mcf of natural gas produced. Just as in the 1st quarter of 2015, the top 10 oil wells are dominated by American Energy Utica and by Guernsey County, although not quite to the same extent. Guernsey had 8 of the top 10 wells this quarter, compared to 9 of 10 in the 1st quarter. Similarly, American Energy Utica went from having 8 of the top 10 oil wells in quarter one to 7 of the top 10 in quarter two. In the 1st quarter of 2015, Antero Resources had 6 of the top 10 gas producing wells. 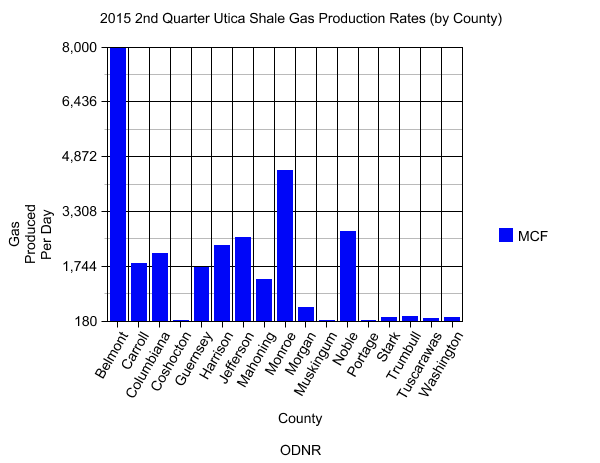 Monroe County was also the top spot for gas production, with 6 of the top 10 wells in that quarter. But in the 2nd quarter it was all about Belmont County, and dominated by Rice Drilling, which went from having the top 3 gas producing wells of quarter one to having the top 8 of quarter two. The following table shows the production figures broken down by county. The two graphs give a visual at how the rates of oil and gas production compare among the 17 counties with wells reporting production. 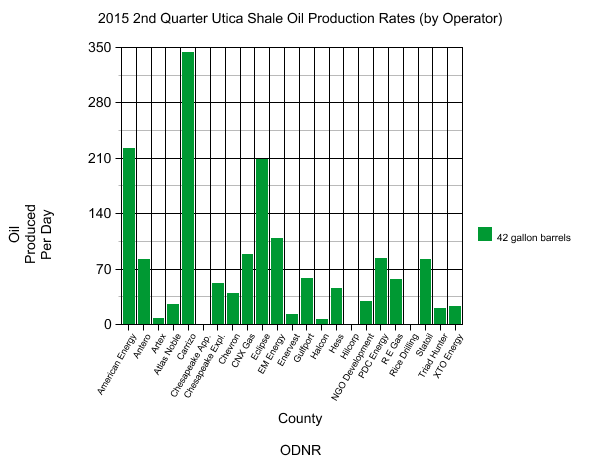 Next up is a table showing production data broken down by operator, and two graphs showing how daily rates of oil and gas production compare among the 23 active operators in the Utica shale during quarter two of 2015. During the second quarter of 2015, Ohio’s horizontal shale wells produced 5,578,255 barrels of oil (bbls) and 221,860,169 Mcf (221 billion cubic feet) of natural gas, according to figures released today by the Ohio Department of Natural Resources (ODNR). These numbers break all previous production reporting records for the last 100 years. Production continues to rise as oil increased by more than 3.1 million barrels and gas by more than 133 billion cubic feet compared to the second quarter of 2014. These figures represent a 126 percent increase in oil production compared to the first half of last year while natural gas production rose 160 percent. For further comparison, only 11 million barrels of oil and 450 billion cubic feet of gas were produced in all of 2014. We will share some more details and breakdowns of the 2nd quarter numbers later today. With the Mahoning County Board of Elections unanimously voting to keep a Youngstown anti-fracking charter amendment proposal off the Nov. 3 ballot, backers of the initiative are unsure of their next step. During a Wednesday special meeting, the board voted 4-0 not to certify the proposal to the ballot. Board members said they largely based their decision on a Feb. 17 decision by the Ohio Supreme Court. That decision says the state constitution’s home-rule amendment doesn’t grant local governments the power to regulate oil and gas operations in their limits, and that Ohio law gives the state government – specifically the Department of Natural Resources – the exclusive authority to regulate oil and gas wells. FrackFree Mahoning Valley has been able to get the charter onto ballots four times before. Each time it has been defeated by voters, but each time the group has vowed to keep coming back for as long as it takes. It would seem to be a virtual guarantee that they will challenge this decision and fight to get the charter put to a vote again. NGI: Appalachian Producers Considering More Pennsylvania Utica as Budget Season Nears - "Following last year's rush to test the boundaries of the Utica Shale outside Ohio, some producers are reevaluating their prospects in the Appalachian Basin to determine how best to spend capital after consistent success from the formation in West Virginia and Southwest Pennsylvania..."
Gas & Oil: The Landman Legacy - "Bryan Hanks, president and owner of Beta Land Services, knows a thing or two about building relationships with clients, he has been a certified professional landman for 34 years. Hanks was introduced at the recent Buckeye STEPS (Service, Transmission, Exploration, Production Safety Network) meeting at Zane State College by Joe Greco, president of..."
Investors.com: Dems Change Tune on Exporting Crude as Oil Plunges - "With oil futures falling below $40 per barrel, it's getting harder to find reasons to support the long-standing ban on exporting U.S. crude, and top Democrats may be warming up to killing it. Republicans have long been for lifting the ban, but most Democrats want to keep..."
Seeking Alpha: Oil Sands vs. Shale - Who Gets Hit First? - "In an environment of oversupply where nobody will cut production, it is up to the market to ultimately rebalance supply through pricing. Such is the current situation with crude oil. Of some 90 million barrels of global production, most experts estimate an oversupply of 2 million barrels per day. While that might not seem like so much, the amount of crude oil storage space in the world is ..."
Forbes: Market Rout Deepens as Deflation Jumps from Oil to Everything Else - "In the early stages of a commodities downturn, lower prices help spur overall economic growth. Cheap inputs make manufactured goods cheaper, profits fatter and consumer costs lower. Cheap oil encourages everyone to drive more. Thus, until recently, global stock markets shrugged off the commodities slump and leapt..."
Forbes: Oil Price Slump: Nearly $250B of Industry Cost Cuts on Cards - "As China’s so-called ‘Black Monday’ knocked the stuffing out of global equities and commodities market, yet another classic reactionary sentiment driven selloff in the oil futures space was glaringly obvious. By 15:47 ET, Brent October futures contract was down 6.27% to $42.61 a barrel, while the WTI was down 5.41% or $2.19 to..."
Pennsylvania DEP: DEP Reaches Penalty Agreements with Three Natural Gas Exploration Companies in the Northern Tier - "The Department of Environmental Protection (DEP) today announced it has finalized penalty agreements with three natural gas exploration companies for methane gas migration violations that impacted private drinking water wells in Bradford, Lycoming, and Tioga counties. “These were complex and lengthy investigations that took a considerable amount of time to resolve, but the department was..."
E&E Legal: E&E Legal Releases Report Exposing Coordination Between Governors, the Obama White House and the Tom Steyer-“Founded and Funded” Network of Advocacy Groups to Advance the “Climate” Agenda - "Today, the Energy & Environment Legal Institute (E&E Legal), a 501 (c) (3) watchdog group, released an investigative report, Private Interests & Public Office: Coordination Between Governors, the Obama White House and the Tom Steyer-“Founded and Funded” Network of Advocacy Groups to Advance the “Climate” Agenda (and an appendix of source documents), revealing a vast, coordinated, three-track effort by public officials and private interests to promote EPA’s expansive, overreaching and economically devastating greenhouse gas rules, specifically the..."
GuruFocus.com: Priceline, Google Among Cooperman's New Holdings - "Cooperman also bought 1,759,300 shares of Gulfport Energy at an average price of $45.84 per share. Gulfport is an oil and natural gas exploration and production company with properties in the Utica Shale and along the Louisiana Gulf Coast. The stock dropped 41% over the past year, closing at $33.76 on Aug. 20, with a current P/E of 24.99. EPS in 2014 was $2.88, up from..."
Wall Street Journal: Political Target: Natural Gas - "America’s natural gas boom has been a rare economic bright spot, and even President Obama likes to take credit for it. But as his term winds down, the Administration is waging a war of regulatory attrition to raise drilling costs and reduce its..."
FTS International: FTS International Provides Well Stimulation for EQT’s Record-Setting Utica Well - "FTS International (FTSI) is proud to be the stimulation provider for EQT Corporation’s record-setting Utica well in southwestern Pennsylvania. EQT announced that its first deep Utica well, for which FTSI provided hydraulic fracturing and wireline services, achieved an average 24-hour test rate of 72.9 MMcf per day into sales during the initial 24-hour flow back test. This initial production (IP) rate equates to..."
The Intelligencer/Wheeling News-Register: AEP Profiting from Shale Expansions - "Even while the electricity generator addressed new Environmental Protection Agency regulations on CO2 and mercury emissions, American Electric Power earned $40 million more from April 1 to June 30 than it did during the same stretch in 2014. Now, the Columbus, Ohio-based firm believes..."
Vorys: Supreme Court of Kentucky Adopts 'At The Well' Rule For Post-Production Costs; Producers Solely Responsible for Severance Tax Payments - "In companion decisions released on August 20, 2015, the Supreme Court of Kentucky confirmed that Kentucky follows the “at the well” rule with respect to post-production costs, but held that the payment of severance taxes must be borne solely by the producer. In Baker v. Magnum Hunter Prod., Inc., the Court affirmed the lower court’s decision in favor of..."
U.S. Chamber of Commerce: Ozone Standard Would Give a Black Eye to the Buckeye State - "About the only thing worse for Ohio than EPA imposing a stricter ozone standard would be a Michigan win over Ohio State. According to the Center for Regulatory Solutions (CRS), 34 counties in Ohio will not meet federal ozone air quality standards if EPA lowers the standard from 75 parts per billion (ppb) set in 2008 to somewhere between..."
Fuel Fix: Shock of Layoffs Still Stings Oil and Gas Workers - "On a recent weekday morning, Maisam Otoum and his daughter arrived at a Houston park amid a fever pitch of humming cicadas to find they had the playground all to themselves. “C’mon daddy,” 3-year-old Lamar said, grabbing his hand and shepherding him from the empty swings to the monkey bars. Since losing his job in March crunching seismic data for a local..."
Reuters: Schlumberger to Buy Oilfield Gear Maker Cameron in $14.8 Billion Deal - "Schlumberger Ltd (SLB.N) will buy equipment maker Cameron International Corp (CAM.N) for $14.8 billion, as the world's top oilfield services firm scrambles to offer a broader range of products at lower prices to oil companies..."
Seeking Alpha: Natural Gas is About to Recover, a Look at the Fundamentals - "Electric plants are switching from coal to cheap natural gas and production growth rates are slowing. It was the same in 2012, when natural gas prices plunged below $2/mmBtu. This time the price was stopped at $2.5/mmBtu and it might be a more gradually sloping..."
Reuters: Oil Falls Towards 6 1/2 Year Lows on Gasoline Build - "Oil fell on Wednesday after U.S. gasoline stocks rose more than expected, compounding negative sentiment after worldwide falls in equities that helped drag fuel prices to 6-1/2-year lows. U.S. crude stocks fell sharply..."
Environmental Integrity Project: Groups File Notice of Intent to Sue EPA Over Dangerous Drilling and Fracking Waste - " A coalition of environmental organizations filed a legal notice with the U.S. Environmental Protection Agency today demanding regulations to stop oil and gas companies from dumping drilling and fracking waste in ways that threaten public health and the environment. The groups filing today’s notice letter are the..."
Tuscarawas County landowners Myron and Nikki Armstrong probably feel like it just makes sense that the oil and gas lease on their property should no longer remain in place. After all, after purchasing their property in 2003 with an existing lease in place, their land was pooled into a drilling unit and a well was drilled. Despite that well being drilled, the family has not received a single royalty check. One would imagine, perhaps, that failure to pay royalties on a well would be very valid grounds to sue for cancellation of a lease. Two Ohio courts have now ruled that it is not. First, Armstrongs were defeated in Tuscarawas County Court, and now the Fifth Appellate District has ruled on appeal that because the lease does not specifically state that the lease can be cancelled if the company does not pay the royalties that the lease says it will pay, the lease is still valid. That seems unlikely, but it still leaves the question of what a landowner should do if they are not being paid royalties as specified in their lease. View the opinion from the court of appeals below. For Aubrey McClendon and his current company, the bad news keeps on coming. Ascent Resources, which recently broke off from parent company American Energy Partners, does not have a very positive financial outlook, according to Moody's Investors Service. Moody's Investors Service, ("Moody's") downgraded Ascent Resources -- Marcellus, LLC's (ARM) Corporate Family Rating (CFR) to Caa2 from B2, Probability of Default Rating (PDR) to Caa2-PD from B2-PD, Senior Secured First Lien rating to Caa1 from Ba3 and Senior Secured Second Lien rating to Caa3 from Caa1. Moody's also lowered the Speculative Grade Liquidity Rating to SGL-4 from SGL-3 to underscore weak liquidity. The rating outlook is negative. "The downgrade reflects our view that ARM has an unsustainable capital structure and that it will struggle with weak liquidity and limited cash flow generation in a low commodity price environment," said John Thieroff, Moody's VP-Senior Analyst. "While we anticipate the company will be able to fully access its currently restricted cash balances through an equity infusion by the company's sponsors, the absence of additional external sources of liquidity and the expectation of persistent low oil and natural gas prices call into question ARM's ability to cover its interest expense or fund capital spending in the second half of 2016." The George C. Marshall Institute has recently released a study on fossil fuels and the economic well-being, http://marshall.org/energy-policy/fossilfuel-energy-and-economic-wellbeing. It describes why energy is an essential input to economic activity. Because fossil fuels are such a large part of the world’s energy supply, they play a dominant role in enabling people everywhere to enjoy a higher standard of living and greater personal freedom. Abundant and affordable energy enables an economy to produce more and grow. If fossil fuels were made more scarce and less affordable, trade and markets would shrink. That would have with adverse effects on income and consumption. The study explains why abundant, inexpensive energy provides great advantages and is highly desirable and by implication why efforts to make fossil fuels more expensive and less available are detrimental to our economic well being. The study acknowledges that the environment is not a free good. Consumption of fossil fuels has an environmental impact. But, the solution to that impact are not policies that impose excessive costs on their use and which attempt to force through regulation a shift to more expensive and less abundant alternatives. The study’s author makes the point that “it is incorrect to think in terms of phasing out fossil fuels, and that rather their advantages and costs need to be weighed against those of other energy sources”. The Obama Administration’s EPA has clearly adopted an agenda that is hostile to fossil fuels. The recent Clean Power Plant rule, proposed revisions to the ozone standard, a CAFÉ standard of 54.5 mpg by 2025, and the just announced methane standard are all intended to force a substitution to alternative forms of energy. These rules are predicated on alleged health effects and necessary action to mitigate adverse climate change. To read more of this article just click here. Spectra Energy Corp (SE.N), an oil and natural gas pipeline company, is bidding for the whole of Williams Companies Inc (WMB.N), even though its market capitalization is about half that of Williams, people familiar with the matter said. Tulsa, Oklahoma-based Williams decided to put itself on the auction block after it rejected an all-stock acquisition proposal from rival Energy Transfer Equity LP (ETE.N) in June. At the time the bid was worth $53.1 billion including the assumption of debt; it was contingent upon Williams' canceling its plans to acquire the portion of its pipeline subsidiary Williams Partners LP (WPZ.N) that it does not already own for $14 billion. Houston-based Kinder Morgan Inc (KMI.N) is also interested in Williams, but would face potential antitrust issues if it proceeded with a bid, the people added. Williams collected an initial round from prospective bidders in late July according to the people. Intrexon Corporation (NYSE: XON), a leader in synthetic biology, today announced that Intrexon Energy Partners (IEP), and Dominion Energy, a subsidiary of Dominion Resources (NYSE: D), have entered into an agreement to explore the potential for commercial-scale biological conversion of natural gas to isobutanol, a drop-in fuel with numerous advantages over other clean burning gasoline blendstocks. Intrexon's proprietary methanotroph bioconversion platform has the potential to transform the gas-to-liquids (GTL) industry through use of optimized microbial cell lines to convert natural gas into higher carbon compounds such as isobutanol and farnesene under ambient temperatures and pressures. This novel approach avoids costly, resource intensive thermochemical GTL conversion methods, and offers a biofuel that does not utilize sugar or other plant-based feedstock, which are expensive carbon sources that compete with food crops for arable land. Additionally, through the substantial yield advantage of the methanotroph over other microbes, Intrexon'sbioconversion platform has a favorable economic profile that, based on current targets, will allow even small scale demonstration plants to achieve profitability within the first year of production. "We are excited to partner with IEP and help realize the promise of their GTL platform to harness a plentiful feedstock in natural gas for the bio-production of isobutanol. Dominion is committed to being a good environmental steward while providing reliable, affordable energy services for our customers," said Diane Leopold, President of Dominion Energy. Conversion of methane to isobutanol provides economic and environmental advantages upon which the collaboration will look to build. In comparison to other gasoline substitutes, isobutanol offers cleaner burning combustion with less corrosion, holds more of gasoline's energy content allowing longer travel, is cheaper to blend with gas, and its compatibility with the current petroleum infrastructure offers a dramatic improvement in efficient transport of the fuel itself. These positive attributes are driving investment in butanol plants which may reach $6 billion by 2020 according to Bloomberg New Energy Finance. "Dominion's operational leadership in natural gas processing and transport along with their extensive geographic footprint makes them an ideal partner to scale-up and commercialize IEP's bioconversion platform," commented Robert F. Walsh, Senior Vice President and Head of Intrexon's Energy Sector. "We believe our innovative biological solution for converting low cost natural gas into higher valued fuels, lubricants and chemicals will transform the gas to liquids field." About Intrexon CorporationIntrexon Corporation (NYSE: XON) is Powering the Bioindustrial Revolution with Better DNA™ to create biologically-based products that improve the quality of life and the health of the planet. The Company's integrated technology suite provides its partners across diverse markets with industrial-scale design and development of complex biological systems delivering unprecedented control, quality, function, and performance of living cells. We call our synthetic biology approach Better DNA®, and we invite you to discover more at www.dna.com. About Dominion Dominion is one of the nation's largest producers and transporters of energy, with a portfolio of approximately 24,600 megawatts of generation, 12,200 miles of natural gas transmission, gathering and storage pipeline, and 6,455 miles of electric transmission lines. Dominion operates one of the nation's largest natural gas storage systems with 928 billion cubic feet of storage capacity and serves utility and retail energy customers in 13 states. For more information about Dominion, visit the company's website at www.dom.com/. TrademarksIntrexon, Powering the Bioindustrial Revolution with Better DNA, and Better DNA are trademarks of Intrexon and/or its affiliates. Other names may be trademarks of their respective owners. Safe Harbor StatementSome of the statements made in this press release are forward-looking statements. These forward-looking statements are based upon our current expectations and projections about future events and generally relate to our plans, objectives and expectations for the development of our business. Although management believes that the plans and objectives reflected in or suggested by these forward-looking statements are reasonable, all forward-looking statements involve risks and uncertainties and actual future results may be materially different from the plans, objectives and expectations expressed in this press release. More people are realizing the shale boom is more than just fracking and its coming to their backyards. The pipelines may have different names and be built by different companies, but the issues are the same from living in a blast zone to fears of losing their property to eminent domain. This video shows the struggle of two women of very different means, dealing with a pipeline company who wants to use eminent domain to build a gas compressor station 500 feet from the farmer’s family home, and a pipeline that will go through both the home and the business of a horse veterinarian, shutting her business down for a year and a half. Williams, like many other corporations who are building pipelines, claim the pipelines will carry American natural gas to Americans.